I guess all good things must come to an end. This weekend was the first time since we moved in that hubs and I did decidedly little. We even started replaying Zelda Majora’s Mask for the N64. Its been great! I’ll be honest, I have worked a little. I’m trying to figure out a 1/2 page version of my 2014 Planner, and it looks like that means completely redoing the whole thing at the smaller size. So, I’ve been plugging away at it. What about you? How was your Halloween? Have you completed any amazing projects? I can’t wait to see!! Also, if you want a reminder email when the party goes up – sign up on the right side bar! The party is after the features!! I’m a huge fan of etching glass. Its so much fun to create the upscale effects! Sometimes, masking and taping isn’t fun at all. Katie has got a way around that! I love the simplicity of this cute decoration. 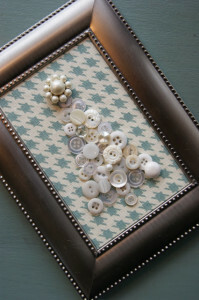 Not to mention the pretty pearly buttons!! I know its a little soon to think of Christmas. But I can’t wait for snow!! 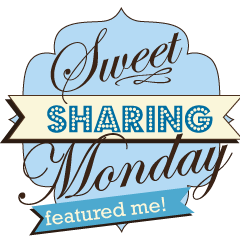 If you were featured don’t forget to grab a button! Enough! 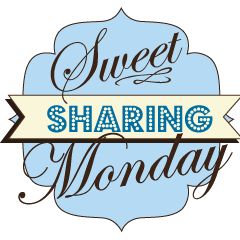 Let’s do some Sweet Sharing! Don’t forget to Check back on Thursday to see which link was the most viewed! To link back to the party- just copy & paste this code onto your blog! Thank you for featuring my Glass Etched Chevron Candle Holder! You have made my day! Good evening, Kayla! Thanks for hosting yet another fantastic hop party – and letting me join in! Have a great week! Thanks for hosting such a nice link party! I look forward to coming each Monday.